Well it has been a productive month in the shop for my daughter. 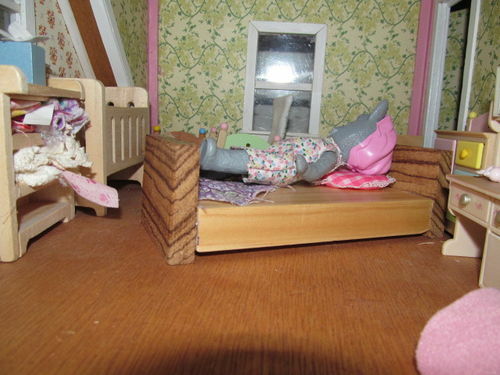 She has tackled some pieces for her dollhouse that she wanted to make on her own. The first was a small easy chair and yesterday we worked on two beds. 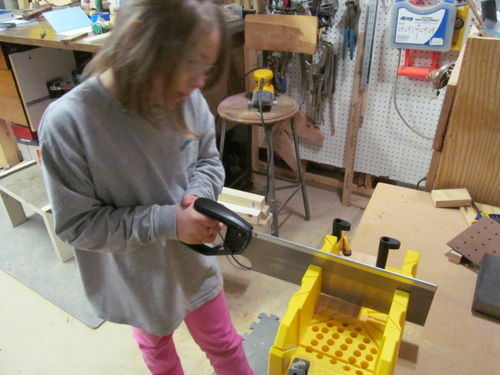 Nothing really special but a great learning experience, for her to be more confident with the saw. I received a new book the other day. 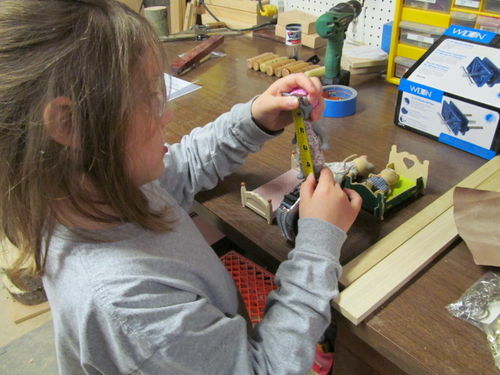 Woodshop for Kids by Jack Mckee which gives some great information about getting kids in the workshop and what they need to be encouraged and succeed. It also has 52 different projects that can be completed by all age groups from preschool to teens. Sophia and I sat one night at reading time and went through the the book to look it over. 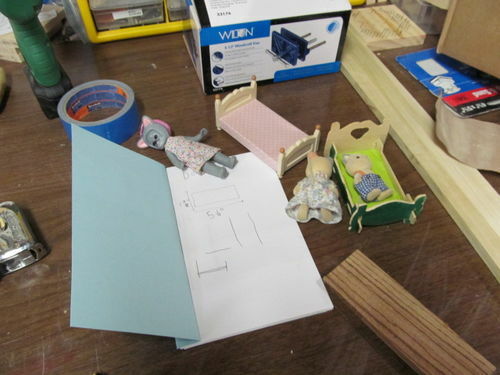 She immediately saw a number of projects she would like to try, dollhouse furniture was of course one of them. I see this as a good step to encourage kids to write down or draw their ideas as well as work on measurements. The book encourages you to use hot glue for doing a number of the projects, which we tried yesterday still not a huge fan of this type of glue for joinery so we have decided if we are in the shop we will be using regular glue and giving it a bit of time to dry. The bed turned out pretty nice, especially with the Zebrawood head and footboard. The second bed was created from craft sticks for the time being, I have the feeling we will be tackling another one with scrap wood. Notice the paperclip clamps, these worked quite well. 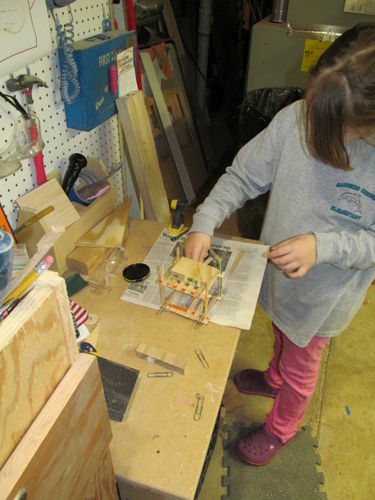 Craft sticks are a great way to introduce kids to building projects. My daughter has built a number of things with them. We have a new lathe project to work on later on today and looking forward to it. Hope you all have a good day in and out of the shop and maybe get some time to work with that child in your life. 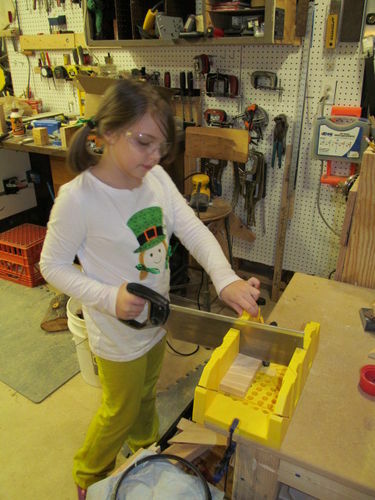 I think it’s great to get your kids working in your shop at a young age. Lots of life’s lessons can be learned there from pride, craftsmanship, dealing with failures (ooopps design modifications), thinking on the fly, working safely with and respecting potentially dangerous items and of course another way of bonding with your kids. Great Job. I’ve found that Bibder Clips are great for gluing small parts. Joel, All of these are very true. I grew up playing in my own workshop from an early age, I am enjoying the fact that my daughter is interested in the same. Great. Watch out once her friends see what she is making you’ll have a shopfull and lots of fun. It’s so awesome to see you work with your daughter. Makes me jealous. Great job sir. AWESOME !!! 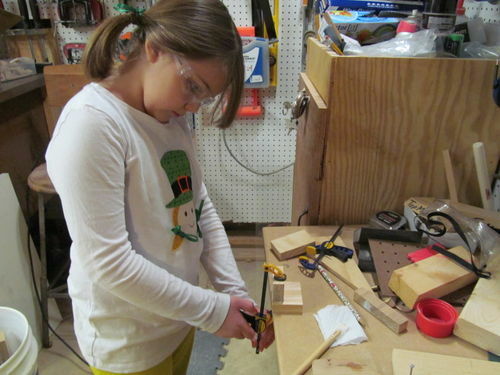 Woodworking aside, great exercises in problem solving and eye/hand coordination. Sure beats pecking away at a Smart(?)Phone. You can see the confidence building in your daughter. Little by little learning ideas and how to build them out. Good job teacher. Demonstrating that with a little work (fun), you can do wondrous things. Way to Go Chris!